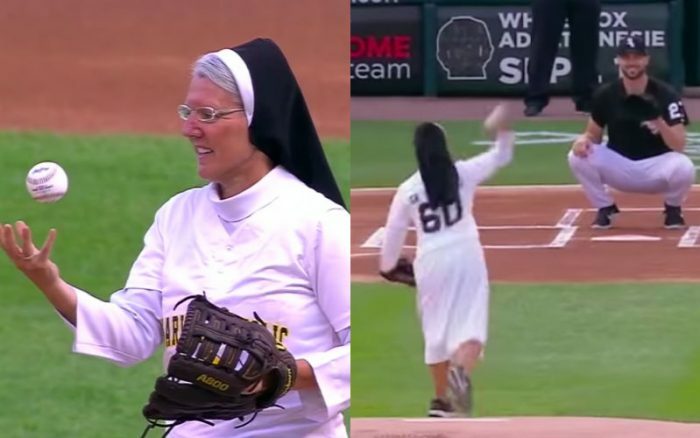 Dominican Sister Who Threw Perfect Curve Ball at White Sox Game Has Sports World Stunned! She’s got quite the pitch! The Chicago White Sox recently played the Kansas City Royals at home at Guaranteed Rate Field. The theme for the game was the 2nd annual “Marian Catholic Night,” in which the local Marian Catholic High School band played for the crowd, among other things. She even did a cool ball trick before her pitch, in which she bounced the ball off her forearm back to her hand. And it’s all made her the talk of the sports world! Yahoo Sports MLB chimed in: “Your new favorite for best first pitch of the season: Sister Mary Jo Sobieck”. She’s even scheduled to appear on Good Morning America on Monday!